The Ecublens based startup ScanTrust SA has joined forces with the National Seeds Institute of Argentina (INASE) to reinforce Argentinian seed industry. ScanTrust will provide new fiscal stamps with advanced secure 2D barcode features to promote safety of farmers from fake seeds and fascilitate traceability. The partnership with Scantrust comes after the INASE, a government organization charged with certifying the quality and identity of seeds to Argentine farmers, established the mandatory use of security fiscal stamp labels for certified hybrid soybean seeds. The requirements dictate that each bag of seeds contain a secure labels with a QR Code along with unique serial number and security elements, enabling traceability and authenticity of seeds to determine which producer it was from, the type of seeds within the bag and that relevant duties have been paid, ensuring it can be legally sold in the market. For INASE, the security label program is key in addressing the growing needs of the seed industry as well as protecting farmers who rely on safe and quality inputs to ensure high production yields and stable incomes. Millions of labels are already on the market, with over 16.5 million labels planned for 2017, and may increase next year with expansion to other crop varieties. 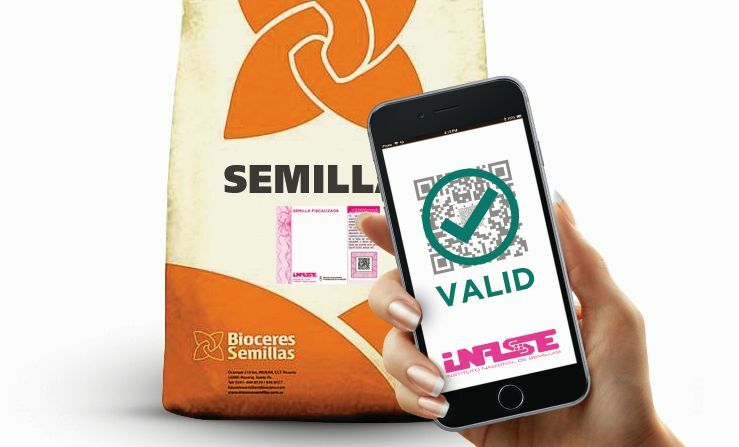 To successfully implement the new system, INASE sought a solution that enabled protection against counterfeiting so Inspectors could securely authenticate seeds in various environments, including remote locations, and access real-time traceability information using a smartphone. In addition, the solution needed to have an acceptable cost to the industry to be adopted on a large-scale. In response to the INASE public tender, Ramón Chozas – a local Buenos Aires security printer and system integrator – evaluated numerous providers of QR code technologies, ultimately selecting ScanTrust due to their innovative technologies combining QR codes and security technologies. The security label solution proposed by Ramón Chozas in partnership with ScanTrust satisfied all government requirements, including development of labels with QR Codes that contain extra security features in the codes that provide protection against copy attempts which normal QR codes or 2D barcodes cannot prevent. INASE Inspectors have been equipped with customized apps for their mobile phone that can authenticate these secure QR codes real-time. Every scan made by inspectors is geolocated, stored in a secure database and accessible in an online dashboard enabling real-time monitoring of the market is therefore ensured, and if a scan indicates a counterfeit or other issues, an alert can be automatically sent to authorized inspectors and authorities. “Having a secure traceability system that offers strong protection against counterfeiting and can be scanned with standard mobile phones was critical for this project. ScanTrust technology passed extensive testing to ensure it matches the high security standards of INASE. Equally important for us was to have a solution that can be implemented with minimal changes to our production workflow to ensure a scalable and cost-effective solution. We are honored to have worked hand-in-hand with INASE to develop this groundbreaking solution to enhance safety within the seed industry in Argentina, and we see high potential for applying similar solutions in Argentina and across Latin America to help solve needs faced by industries and governments”, said Pedro Etchemalte, CTO at Ramón Chozas.